Sir Laurens Jan van der Post, CBE (December 13, 1906 – December 16, 1996) was a 20th century Afrikaner author of many books, farmer, war hero, political adviser to British heads of government, close friend of Prince Charles, godfather of Prince William, educator, journalist, humanitarian, philosopher, explorer, anthropologist and conservationist. Van der Post was born in the small town of Philippolis in the Orange River Colony, the post-Boer War British name for what had previously been the Afrikaner Orange Free State in what is today South Africa. His father, Christiaan Willem Hendrik van der Post (1856–1914), of Dutch origin, had arrived in South Africa at the age of three and had married van der Post's mother in 1889. He spent his early childhood years on the family farm, and acquired a taste for reading from his father's extensive library, which included Homer and Shakespeare. His father died in August 1914. In 1918 van der Post went to school at Grey College in Bloemfontein. There, he wrote, it was a great shock to him that he was "being educated into something which destroyed the sense of common humanity I shared with the black people". In 1925 he took his first job as a reporter in training at The Natal Advertiser in Durban. In 1926 he and two other rebellious writers, Roy Campbell and William Plomer, published a satirical magazine called Voorslag (English: whip lash) which promoted a more racially integrated South Africa; it lasted for three issues before being forced to shut down because of its radical views. Later that year he took off for three months with Plomer and sailed to Tokyo and back on a Japanese freighter, the Canada Maru, an experience which produced books by both authors later in life. In 1927 Van der Post met Marjorie Edith Wendt (d. 1995), daughter of the founder and conductor of the Cape Town Orchestra. They traveled to England and on March 8, 1928, married at Bridport, Dorset. A son was born soon after on December 26, named Jan Laurens (later known as John). In 1929 van der Post returned to South Africa to work for the Cape Times, a newspaper in Cape Town. He began to associate with bohemians and intellectuals who were opposed to James Hertzog (Prime Minister) and the white South African policy. In an article entitled 'South Africa in the Melting Pot', which clarified his views of the South Africa racial problem, he said "The white South African has never consciously believed that the native should ever become his equal." In 1931 he returned to England and formed friendships with members of the Bloomsbury group including Arthur Waley, J. M. Keynes, E. M. Forster and Virginia Woolf. Virginia and her husband Leonard Woolf were publishers, and had previously published William Plomer's works, and it was through Plomer's connections that van der Post gained introduction to the Woolfs and the Bloomsbury Set. In 1934 the Woolfs published van der Post's first novel under the Hogarth Press label. Called In a Province, it portrayed the tragic consequences of a racially and ideologically divided South Africa. Later that year he decided to become a dairy farmer and bought a farm called Colley Farm, near Tetbury, Gloucestershire. There he divided his time between the needs of the cows and occasional visits to London where he was a correspondent to South African newspapers. He considered this a directionless phase in his life which mirrored Europe's slow drift to war. In 1936 he made five trips to South Africa and during one trip he met and fell in love with Ingaret Giffard (d. 1997), an English actress and author five years his senior. Later that year his wife Marjorie gave birth to a second child, a daughter named Lucia, and in 1938 he sent his family back to South Africa. When the Second World War started in 1939 he found himself torn between England and South Africa, his new love and his family; his career was at a dead end, and he was in depressed spirits, often drinking heavily. In May 1940, van der Post volunteered for the British Army and upon completion of officer training in January 1941 he was sent to East Africa in the Intelligence Corps as a Captain. There he took up with General Wingate's Gideon Force which was tasked with restoring the Emperor Haile Selassie to his throne in Abyssinia. His unit led 11,000 camels through difficult mountain terrain and he was remembered for being an excellent caretaker of the animals. In March he came down with malaria and was sent to Palestine to recover. In early 1942, as Japanese forces invaded South East Asia, van der Post was transferred to Allied forces in the Dutch East Indies (Indonesia), because of his Dutch language skills. By his own statement, he was given command of Special Mission 43, the purpose of which was to organise the covert evacuation of as many Allied personnel as possible, after the surrender of Java. On April 20, 1942, he surrendered to the Japanese. He was taken to prison-camps first at Sukabumi and then to Bandung. Van der Post was famous for his work in maintaining the morale of prisoners of many different nationalities. Along with others, he organised a "camp university" with courses from basic literacy to degree-standard ancient history, and he also organized a camp farm to supplement nutritional needs. He could also speak some basic Japanese, which helped him greatly. He wrote about his prison experiences in A Bar of Shadow (1954), The Seed and the Sower (1963) and The Night of the New Moon (1970). Japanese film director Nagisa Oshima based his film Merry Christmas, Mr. Lawrence (1982) on the last two of these books. Following the surrender of Japan, while his fellow POWs were repatriated, van der Post chose to remain in Java, and on September 15, 1945, he joined Admiral William Patterson on HMS Cumberland for the official surrender of the Japanese in Java to British forces representing the Allies. Van der Post then spent two years helping to mediate between Indonesian nationalists and members of the Dutch Colonial Government. He had gained trust with the nationalist leaders such as Mohammad Hatta and Ahmed Sukarno and warned both Prime Minister Clement Attlee and the Allied Supreme Commander in South East Asia, Admiral Lord Louis Mountbatten, whom he met in London in October 1945, that the country was on the verge of blowing up. Van der Post went to The Hague to repeat his warning directly to the Dutch cabinet. In November 1946, British forces withdrew and Van der Post became military attaché to the British consulate in Batavia. By 1947, after he had returned to England, the Indonesian Revolution had begun. The events of these post-war years in Java are examined in his memoir The Admiral's Baby (1996). That same year, Van der Post retired from the army and was made a CBE. With the war over and his business with the army concluded, van der Post returned to South Africa in late 1947 to work at the Natal Daily News, but with the election victory of the National Party and the onset of apartheid he came back to London. He was later to publish a critique of apartheid (The Dark Eye in Africa, 1955), basing many of his insights on his developing interest in psychology. In May 1949 he was commissioned by the Colonial Development Corporation (CDC) to "assess the livestock capacities of the uninhabited Nyika and Mulanje plateaux of Nyasaland". Around this time he divorced Marjorie, and on October 13, 1949, married Ingaret Giffard. He went on a honeymoon with Ingaret to Switzerland, where his new wife introduced him to Carl Jung. Jung was to have probably a greater influence upon him than anybody else, and he later said that he had never met anyone of Jung's stature. He continued to work on a travel book about his Nyasaland adventures called Venture to the Interior, which became an immediate best-seller in the US and Europe on its publication in 1952. In 1950 Lord Reith (head of the CDC) asked van der Post to head an expedition to Bechuanaland, to see the potential of the remote Kalahari Desert for cattle ranching. 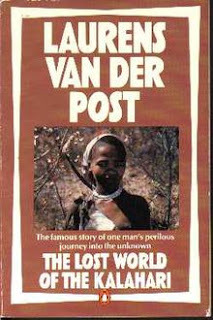 There van der Post for the first time met the hunter-gatherer bush people known as San. He repeated the journey to the Kalahari in 1952. In 1953 he published his third book, The Face Beside the Fire, a semi-autobiographical novel about a psychologically "lost" artist in search of his soul and soul-mate, which clearly shows Jung's influence on his thinking and writing. Flamingo Feather (1955) was an anti-communist novel in the guise of a Buchanesque adventure story, about a Soviet plot to take over South Africa. It sold very well. Alfred Hitchcock planned to film the book, but lost support from South African authorities and gave up the idea. In 1955 the BBC commissioned van der Post to return to the Kalahari in search of the bushmen, a journey that turned into a very popular six-part television documentary series in 1956. In 1958 his most famous book was released under the same title as the BBC series: The Lost World of the Kalahari, followed in 1961 by The Heart of the Hunter, derived from 19th-century Bushmen stories by Wilhelm Bleek. Van der Post described the Bushmen as the original natives of southern Africa, outcast and persecuted by all other races and nationalities. He said they represented the "lost soul" of all mankind, a type of noble savage myth. This mythos of the Bushmen inspired the colonial government to create the Central Kalahari Game Reserve in 1961 to guarantee their survival, and the reserve became a part of settled law when Botswana was created in 1966. Van der Post's fame and success were now assured. He had become a respected television personality, had introduced the world to the Kalahari Bushmen, and was considered an authority on Bushman folklore and culture. "I was compelled towards the Bushmen," he said, "like someone who walks in his sleep, obedient to a dream of finding in the dark what the day has denied him." Over the next fifteen years he had a steady stream of publications, including the two books drawn from his war experiences (see above), a travel book called A Journey into Russia (1964) describing a long trip through the Soviet Union, and two novels of adventure set on the fringes of the Kalarahi desert, A Story Like the Wind (1972) and its sequel A Far-Off Place (1974). The latter volumes, about four young people, two of them San, caught up in violent events on the borders of 1970s Rhodesia, became popular as class readers in secondary schools. In 1972 there was another BBC television series of his 16-year friendship with Jung, who died in 1961, which was followed by the book Jung and the Story of our Time (1976). Ingaret and he moved to Aldeburgh, Suffolk, where they became involved with a circle of friends that included an introduction to Prince Charles, whom he then took on a safari to Kenya in 1977 and with whom he had a close and influential friendship for the rest of his life. Also in 1977, together with Ian Player, a South African conservationist, he created the first World Wilderness Congress in Johannesburg. In 1979 his Chelsea neighbor Margaret Thatcher became Prime Minister and she called on his advice with matters dealing with southern Africa, notably the Rhodesia settlement of 1979–80. In 1981 he was given a Knighthood. In 1982 he fell and injured his back and used the downtime from tennis and skiing to write an autobiography called Yet Being Someone Other (1982), which discussed his love of the sea and his journey to Japan with Plomer in 1926. (His affection for that country and its people, despite his wartime experiences, had first been explored in 1968 in his Portrait of Japan). By now Ingaret was slipping into senility, and he spent much time with Frances Baruch, an old friend. In 1984 his son John (who had gone on to be an engineer in London) died, and van der Post spent time with his youngest daughter Lucia and her family. 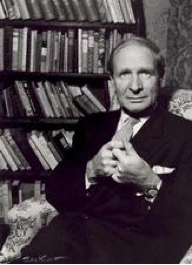 Even in old age Sir Laurens van der Post was involved with many projects, from the worldwide conservationist movement, to setting up a centre of Jungian studies in Cape Town. He remained a captivating speaker and storyteller both in public and in private. A Walk with a White Bushman (1986), the transcript of a series of interviews, gives a taste of his appeal as a conversationalist. In 1996 he tried to prevent the eviction of the Bushmen from their homeland in the Central Kalahari Game Reserve, which had been set up for that purpose, but ironically it was his work in the 1950s to promote the land for cattle ranching that led to their eventual removal. In October 1996 he published The Admiral's Baby, describing the events in Java at the end of the war. For his 90th birthday party he had a five-day celebration in Colorado, with a "this is your life" type event with friends from every period of his life. A few days later, on December 16, 1996, after whispering in Afrikaans "die sterre" (the stars), he died. The funeral took place December 20 in London, attended by Zulu chief Mangosuthu Buthelezi, Prince Charles, Lady Thatcher, and many friends and family. His ashes were buried in a special memorial garden at Philippolis on April 4, 1998. Ingaret died five months after him on May 5, 1997.